Some HTTP requests are long running and instead of asking users to wait for the long running operation to complete, they will return a “request status URI” that, when requested, will return a running/success/failure message. Here’s how to deal with this scenario in Postman. 1. Execute the long running request. 2. Execute the check long running request status request. 3. If still running, then delay for 30 seconds and repeat #2. If not still running, then pass or fail the request based on status returned. This will create a Postman timeout that doesn’t chew up your CPU. “delay” is the number of minutes to delay before the next execution. After the request is delayed it will execute this “test” which checks to see if there’s a “nextRequest” environment variable and then calls the “setNextRequest” method to execute it. See How to Use Azure Active Directory (AAD) Access Tokens in Postman for instructions on how to get a bearer token. 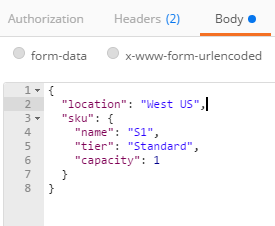 This request will call the “Azure-AsyncOperation” URI, check the status, call Delay, which will then execute the status check again. Add the following test to check the status and if still running will set the next request to ‘Delay’, which in turn will execute this request again. I'm moving to Starbucks to be the new Chief Coffee Officer!